Whether it’s always been your dream since you were a kid or a revelation that came to you when you were in college, you’ve decided you want to attend medical school. However you arrived at your decision, once you are finished with undergrad and maybe taken a gap year or two, you are faced with an even more difficult decision. There are almost 200 medical schools in the United States. Not to mention Doctors of Osteopathic Medicine (DO) and Caribbean schools. As a result, you may find yourself asking: What medical schools should I apply to? To help ease your process, I’ve outlined some factors to consider when making your school list for the medical school application process. As a start, you can look over the top schools in the country and their acceptance rates, and you will immediately notice just how ridiculously low these stats are. I’ve also gone over prerequisites for medical schools, some of the specialties available at different schools, and the numbers you typically need to be accepted. Finally, I’ve talked about different policies and questions to consider in making your list as well as why you should also consider DO and Caribbean schools. As the number of applicants significantly rises, the acceptance rates at medical schools continue to fall. In 2018, 21,622 applicants were accepted into medical school out of the 52,777 who applied. 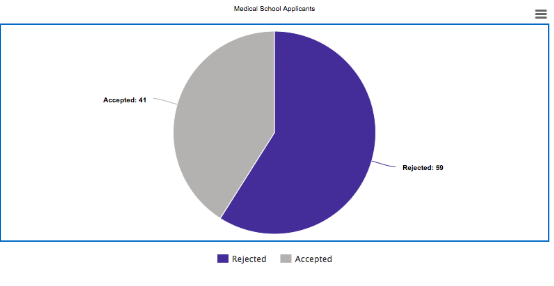 Only 41% of students who applied got into any medical school! As you can see, the gray slice is significantly smaller than the purple slice. Still asking “what medical schools should I apply to?” Very well. Remember, you have to be extremely careful which schools you put on your list. In case the data doesn’t speak for itself, let me tell you that the process is nothing short of the most competitive. Below is a list of the top 30 schools in US News’ ranking of the medical schools in the United States, along with their acceptance rates. As you can tell from the table, the acceptance rates at the best medical schools are extremely low. The least selective school among the top 30 medical only has an acceptance rate of 11%. And even then, 89% of applicants are rejected! The average medical school acceptance rate is 7%. The Association of American Medical Colleges (AAMC) explains that the average number of applications is 16 schools per applicant. To stay on the safer side, I recommend that you apply to 25-30 schools. I cannot emphasize enough how competitive medical schools are. Maybe don’t go as high as 50 schools because that would be stretching yourself too thin. Any number over 40 could compromise the quality of your application. Applying to too few schools can also put you in a difficult position. When asking yourself “what medical schools should I apply to?” keep in mind the reality that very few students get interviews for, let alone get accepted into, the schools in the Top 30. Even if you have a long list of schools that you’ve applied to, a huge number of applicants are cut between the secondary and the interview stages. You will only get a handful of interviews. Not only do you need to apply to many schools, but you need to apply to many tiers of schools to try to give yourself options. Applying to below 20 schools reduces your chances of acceptance into any school because the process is so selective. There is literally no “safety” school in the medical school application process. While some are clearly more selective than others, the admissions process for any medical school is cutthroat. It is of course okay to want to go to a top school, but do not get too attached to the idea of attending Harvard until you’ve been accepted. Let’s not forget that applying to many schools is also very expensive. The AMCAS costs $160 for the application, and one school, and then $38 per additional school. Therefore, if you apply to 25 programs, your total would come up to $1,110. The cost of secondaries varies from school to school - for some schools the cost of secondaries is $50, and for some $100. Therefore, the question “what medical schools should I apply to?” becomes more crucial than ever. You don’t want to spend all your savings applying to medical school. Save some for tuition! When should I apply to the medical schools on my list? Ideally, you should submit your primary as soon as the AMCAS opens in May, otherwise the whole process will be slowed down. Once you have submitted your primary application to the AMCAS system, you will receive the secondaries for each school. The time you take to return your completed secondaries reflects your interest in the school. Ideally, you shouldn’t take more than two weeks to complete them because not only does it affect your impression on the school, it slows the entire process down. The more schools you apply to, the more secondaries you’ll be dealing with on top of the huge pressure you’re already under. If you apply to too many schools, you probably cannot write stellar applications for each school and return all of them within this timeframe. It should be of no surprise that to get into the top schools, you need to have a very high GPA and a high MCAT Score. Below is the average GPA and MCAT scores for the top schools. As you will notice, the standards at these programs are very high. As you can see these numbers at the top medical schools are extremely high. State schools are a great option, as they offer lower tuition and higher acceptances for in-state applicants. Baylor’s overall acceptance rate is 4%, but the in-state acceptance is actually 13.4%. Still low, but triple the odds! To get into the top schools, your GPA has to be near perfect, and you have to place higher than most of your peers. Run your scores alongside these numbers. Think about your own score profile and make more realistic school lists for yourself. Most MD applicants are far out of range for these institutions. If your score is in the lower 500s, applying to Johns Hopkins or UPenn may not be the best call. If you want to raise your MCAT score, retake it, but make sure to prepare even better than you did the first time. Making a study plan, forming a study group, and taking practice tests under timed conditions can all help in the process. Keep in mind: Some schools also have number filters and do not take applicants who do not meet their lowest requirement. Typically this filter is low (at a 3.0), but if you do not meet their filter, your application won’t be read. This is an important factor to remember when asking “what medical schools should I apply to?” You should automatically weed out schools that you may not be qualified for, and should not waste your time working on these applications. When asking yourself “what medical schools should I apply to?” remember that you should not choose a medical school just because it is a top institution. Consider what kind of doctor you want to become and research which schools have the focus and opportunities that you seek. You should also look through websites and see if your mission in pursuing medicine aligns with a given medical school’s mission. You will be spending a very long time working with the faculty and the curriculum. If you’re not a good match, you will not have a very gratifying experience during medical school and in turn it could become more of a chore than a passion. Below, I have outlined unique opportunities at various medical schools. I have included high ranked, middle ground, and also lower ranked medical schools to highlight the range you should consider. Look at the specialties, professors who can help you reach your goals, the mission statements of schools, and whether their philosophy aligns with your interest in the field of medicine. Over 11,000 faculty in medicine. MD students can choose one of two tracks. The first is Pathways, where students get both early and advanced clinical experience, basic science experience and a scholarly project which would shape their individual path to an MD degree. The second is Health Sciences & Technology, co-offered with MIT for students interested in biomedical research and physical sciences. Very early hands-on experience including patient interviews and conducting physical exams. The Genes to Society program with very early clinical experience which helps understand the patient as an individual. Leadership opportunities within and outside Stanford, such as the Leadership in Health Disparities program. Dual degree opportunities across other schools in Stanford, including a subsidized dual degree for students who want to complete a PhD from Stanford. Medical Plunge program during orientation showing first year students the impact of social inequity on access to health care. Student research opportunities such as the National Heart, Lung, and Blood Institute/Dean’s Summer Research Program, and the Development of Clinician/Researchers in Academic ENT/Summer Research for Students. Unique student groups, such as Medical School Musical and CHOICES for Youth In Detention, which is an outreach initiative dedicated to improving health and wellbeing of incarcerated teens. Personalized program in patient care, biomedical research, dual degrees, and science of health care delivery. Ranks number one in more disciplines than anywhere in the country. Over 80% of students graduate having a research manuscript published in a peer reviewed journal. Primary Care Leadership track, pairs students with the Durham community to gain hands on experience understanding health disparities and focusing on community engagement. Medical Scientist training program trains students as physician-scientists using biomedical and social science approaches. Longitudinal Integrated Clerkship Program, where students follow patients over a substantial amount of time. Standardized Patient Program providing students with hands-on patient experience. Longitudinal research projects that could be a summer research program or a year long intensive research program. Integrated Basic & Clinical Science Curriculum with eight Masters Courses, three Longitudinal Courses, and nine Longitudinal Courses spread out over the first 18 months. Interprofessional Longitudinal Clinical Experience, which is designed to prepare first year students effectively based on the current healthcare and academic environment. Stipends (summer-based, short-term, and one year) given to facilitate student research. Clinical Medical Center, which utilizes simulated and standardized patients and equipment to train medical students, and assess their communication and physical exam skills in a safe training environment. Third year clerkships at University of Chicago Medicine or NorthShore University HealthSystem's Evanston Hospital Campus in Medicine, Surgery, Pediatrics, OB/GYN, Psychiatry, Family Medicine and Neurology. Pass/Fail system to urge students to collaborate. Integrated 18-month Foundational Sciences curriculum includes one-on-one patient contact, top technological resources, and small group settings. Affiliation with the Texas Medical Center allows students to a wide variety of patient exposure. Dual programs in MD/MBA, MD/Masters in Public Health. Opportunity to start working with standardized patients from day one at the Sentara Center for Simulation and Immersive Learning. Leading technology in ultrasound that students can start using in their first weeks. Present and active role for students in rounds at varied training environments. Dual MD/PhD program in Molecular Genetics and Microbiology. Global Medical Education program which allows students to gain first hand medical experience working at an international site. Medical Scientist Training Program in association with the Brookhaven National Laboratory and Cold Spring Harbor Laboratory which students with research opportunities. New Horizons curriculum, which prioritizes innovation, integration of early clinical experiences with scientific content and increased time during the last three semesters for students to tailor their educational experience. Performance-Based Assessment Program, which allows students to interact with standardized patients. CCOM Rural Iowa Scholars Program (CRISP), where students help residents of rural Iowa gain access to healthcare. When searching for the answer to the question “what medical schools should I apply to?” you’re probably also wondering exactly what the prerequisites and applications are like. The exact prerequisite courses for medical school admissions depends on the school, but generally students have to take at least one year of biology, one year of physics, one year of English, and two years of chemistry. The schools on your list should also depend on the courses you have taken, as you cannot apply without them. Don’t even think about applying to medical school until you have conquered the prereqs! Most schools will not read your application if you haven’t completed their necessary courses, so don’t underestimate required classes. Taking the courses is not enough. Remember how the Common App required you to fill out your extracurricular activities? So does the AMCAS. Alongside great scores and meeting academic requirements, students must also display a demonstrated interest in medicine through different clinical, research and volunteering experience. These could include shadowing a doctor, volunteering at a local children’s hospital, and any other opportunity that gives you patient and clinical exposure. Know which activities stand out on your application. You have the space to talk about 15 activities. This is a pretty high number so make sure to work on building your activities profile far in advance. Your personal statement is another key aspect of your application. Remember that the thousands of other applicants all want to study medicine as well. Your personal statement should be unique to you, tell the story behind your choice to pursue medicine, and convey genuine interest instead of a generic response. Schools want to see that you are a fit for them as much as you do. Discuss your school list with your recommenders. Your letters of recommendation (ideally five to seven) should support your personal statement. Your recommenders should be well aware of your goals and interests within the field of medicine and how the schools on your list could benefit from having you as a student. It can be tempting to only apply to Ivy Leagues or the best ten medical schools in the country when trying to answer your question of “what medical schools should I apply to?” but do not overlook DO and Caribbean schools if your numbers aren’t in range for MD programs. DO covers more of the holistic care of the body, looking at the patient as an individual rather than their organs. DO programs are generally easier to get into than MD programs. If your MCAT score is in the lower 500s, DO schools might be a good option for you. According to the National Resident Matching Program, DO school graduates have excellent residency placement rates. Attending a DO School also keeps your options open because you enter any specialty you want. You have to apply through the American Association of Colleges of Osteopathic Medicine application system. Similar to preparation for MD school applications, make sure your extracurriculars are strong and reflective of your interest, specifically towards osteopathic medicine. If you know in advance that you would like DO schools as an option be sure to gain similar clinical experience and shadow an osteopathic physician. Although DO schools aren’t as reputable, they can train you in ways MD programs can’t. For example, DO students study osteopathic manipulative treatment, which treats diseases by fixing muscles and bones. Upon graduation, DO students can apply to both MD and DO residencies, which MD students cannot. Who knows, you might end up falling in love with osteopathic medicine and decide you want to go to a DO residency. Or, you have the chance to choose an MD residency. Either way, your options are open. Caribbean schools, which are medical programs in the Caribbean, are significantly less selective than schools in the United States. If your score is in the high 400s and you don’t want to retake the MCAT or reapply in the next cycle, consider putting Caribbean schools on your list. Caribbean schools do not place a lot of weight on your MCAT scores, and in fact some Caribbean schools do not even require an MCAT score. Whereas the acceptance rates at US MD schools keep falling, Caribbean schools have fewer applicants and higher acceptance rates. They also have rolling admissions and two to three admission cycles a year, so if you do not get accepted the first time, you don’t have to wait a whole year! Some Caribbean schools also offer accelerated programs to save time. All this, and you get to enjoy the tropical weather. It’s not a bad deal! One thing to remember is that if you attend a Caribbean school, it becomes harder for you to be placed into an American residency program. However, top Caribbean schools do have clinical affiliates in the United States, with slots reserved for their students. Graduates from the St. George’s University School of Medicine, American University of the Caribbean School of Medicine, Saba University School of Medicine, and Ross University School of Medicine can practice in all 50 states in the US. It isn’t easy figuring out the answer when asking yourself “what medical schools should I apply to?” While there are plenty of schools to choose from, there are also numerous factors both in your numbers, interests and activities, as well as the schools’ mission and offerings that you have to consider. Do not rush the process. Sit down with several schools and draw a pros and cons list. Talk to current students or alums. Run your numbers alongside admitted students’ ones. Yes, the process isn’t easy, but, if done with careful calculation, paying extra attention to your list can benefit you greatly in the long run, and help you get into a school that is perfectly suited for you.